Article from Arc’s 2017 Winter Newsletter. From 2015-2017 Matt Purtill undertook field work in the Sandy Springs region of Rock Run for his doctorate at West Virginia University. Combining his love of geology, geography, anthropology, and archaeology, he studied the greatest collection of ancient sand dunes in the entire Ohio River Valley. Many of the sand dunes have been washed away by Ohio River floods. But as luck would have it, the most intact dunes are located on Arc lands and its immediately adjacent tract, the Sandy Springs cemetery. 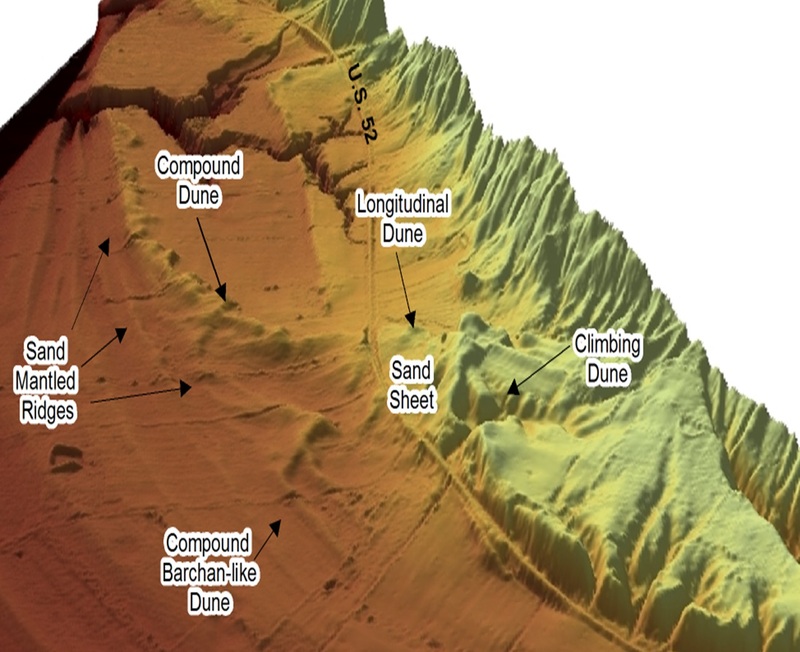 Matt’s studies found evidence that the dunes have been quite dynamic over the last 14,000 years, shifting multiple times since the last glacier melted out of Ohio – even as recently as 1400 years ago. Some dune deposits were wind driven, some sand deposits were flood driven. The most dramatic wind movements occurred 4200 and 8200 years ago during times of presumed drought. Matt’s discoveries led to the exciting conjecture that more Paleoindian artifacts are yet to be found beneath layers of these shifting sands. The Paleoindians were nomadic adventurers who lived 13,500 to 11,800 years ago. They courageously penetrated new lands in the North that were being exposed by the melting glaciers. If the age of their artifacts indicate the timing of their eastern migration (as opposed to, say, the spread of new technology in already established populations), the Paleoindians migrated an astonishing 14,000 km in just 1000 years to reach Eastern North America from Siberia. Sandy Springs has produced large numbers of the prolific and diagnostic Paleoindian projectiles known as fluted points. It has been estimated that over 1000 of these Clovis-like points have been found in Ohio, a density second only what has been found in Alabama. Roger Cunningham, an insurance salesman from Rock Run’s Buena Vista, first wrote about Sandy Spring’s artifacts back in 1973. 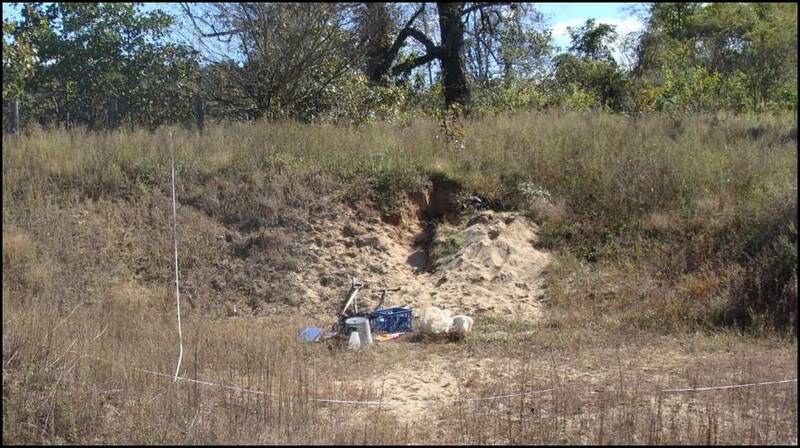 Many of the Paleoindian points he studied are still in the stewardship of local residents whose ancestors collected them on the sandy surface of their agricultural fields. The high density of projectile points at Sandy Springs indicate that a relatively high concentration of indigenous peoples gathered in the sandy flats along the Ohio River during the Paleoindian era, presumably to hunt, but perhaps for other reasons as well. Over 1000 fluted Paleoindian points are known from Ohio. Significantly, 100 of these points were collected at Sandy Springs, a much larger number than from any other single early Paleoindian site in Ohio. Matt is now driven by the question, “Why did the Paleoindians gather in such large numbers at Sandy Springs?” It was once theorized that they came to hunt game that were gathering around salt licks, but Matt found no evidence of salt licks in the area to support such a theory. Matt theorizes that perhaps game made seasonal migrations across the Ohio River at Sandy Springs, even today an unusually shallow section of the river. Such a well-used game route would have provided early peoples with excellent hunting opportunities. Or perhaps the sandy soils, known to hold more heat than other soils, provided extended grazing seasons for animals, as well as extended growing seasons for the grasslands that nourished them. Matt admits that the results of his studies have served to add even more questions to his research bucket list. He considers this a sure indication of a successful investigation. Matthew P. Purtill is currently working at Ball State University in its Applied Anthropology Laboratories. His final thesis is awaiting publication. All photos were supplied by Matt Purtill. 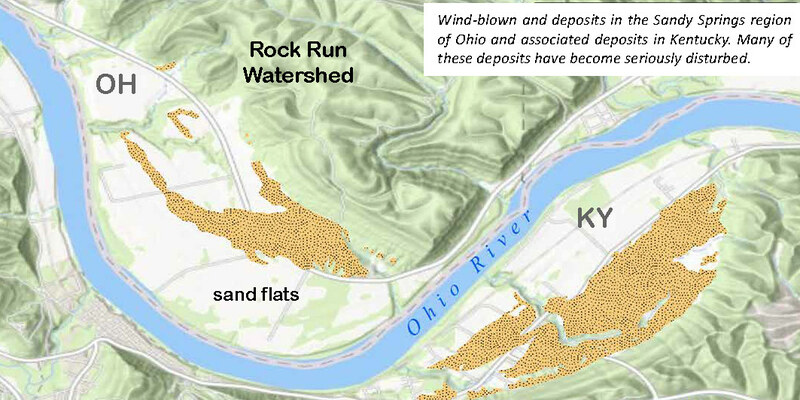 Wind-blown and deposits in the Sandy Springs region of Ohio and associated deposits in Kentucky. Many of Rock Run these deposits have become seriously disturbed. Types of Sand Deposits at Sandy Springs. Illustration showing SR 52, and the old sand dunes stacked up against the wall of Appalachian hills owned by the Arc of Appalachia. The wide flat plain on the left are sandy soils smoothed by Ohio River flooding. Matt Purtill’s excavation study site at the Arc’s Rock Run Preserve. 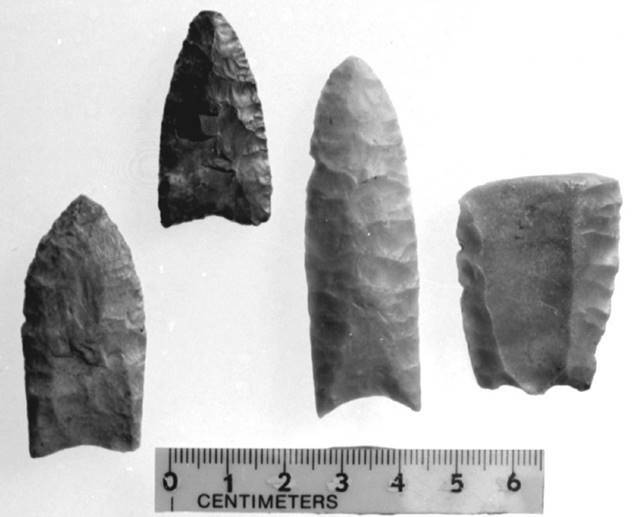 Examples of Paleoindian fluted points.